Nomex® (styled NOMEX) is a registered trademark for flame resistant meta-aramid material developed in the early 1960s by DuPont™ and first marketed in 1967. NOMEX® can be considered an aromatic nylon, the meta variant of the para-aramid Kevlar. It is sold in both fiber and sheet forms and is used as a fabric wherever resistance from heat and flame is required. Nomex® sheet is actually a calendered paper and made in a similar fashion. Nomex® Type 410 paper is the original and one of the larger grade types made, mostly for electrical insulation purposes. The Spruance plant, in Richmond, VA, is the sole North American paper production site. The paper is used in electrical laminates such as circuit boards and transformer cores as well as fireproof honeycomb structures where it is saturated with a phenolic resin. Honeycomb structures such as these, as well as mylar Nomex® laminates are used extensively in aircraft construction. Both the firefighting and vehicle racing industries use Nomex® to create clothing and equipment that can withstand intense heat. All aramids are heat and flame resistant but Kevlar, having a para orientation, can be molecularly aligned and gives high strength. Meta aramid cannot align during filament formation and has poor strength. Nomex® fiber is made in the USA and in Spain (Asturias). More Firefighters are wearing a uniform comprised of Nomex® than ever before. The Nomex® fabric is proven more durable, longer lasting and safer than any other “station-wear” uniform available. 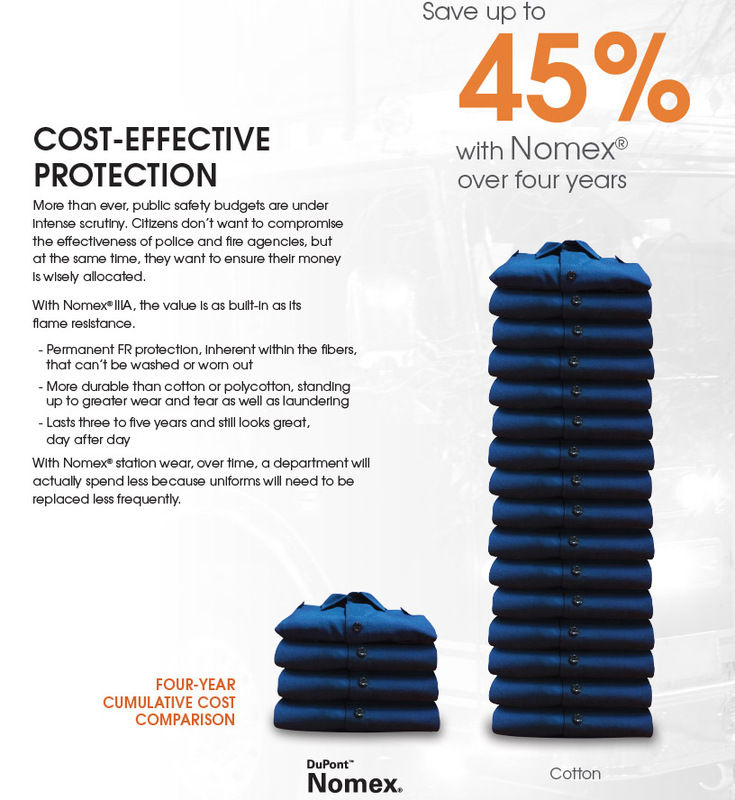 Although initially, a more costly investment, Nomex® lasts approximately 3 – 5 times longer than any other standard station-wear uniform. 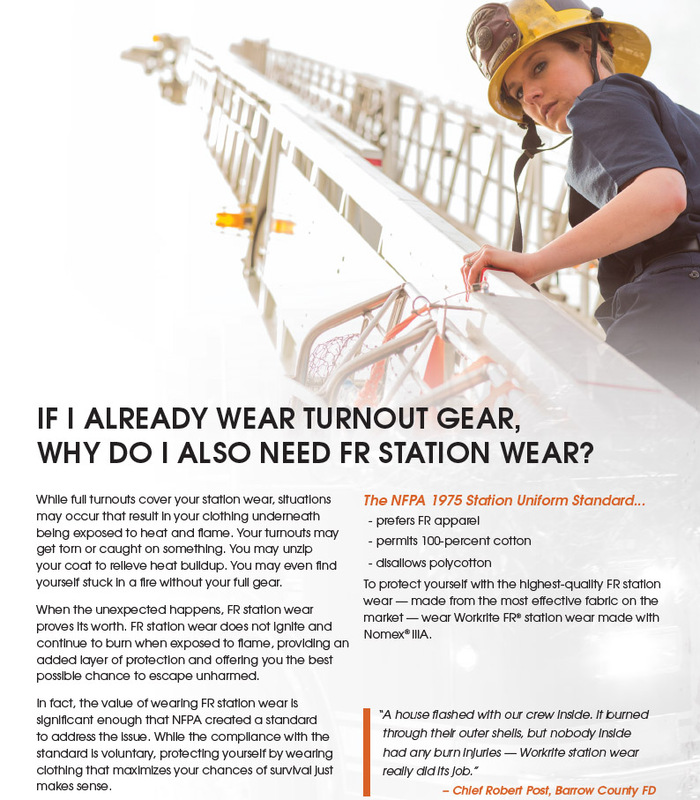 In addition to its unmatched durability and color-retention characteristics, Nomex® is proven far and above safer than standard cotton, poly-cotton, or polyester fabric station-wear. A Nomex® hood is a common piece of Racing and firefighting equipment. It is placed on the head on top of a firefighter's face mask. The hood protects the portions of the head not covered by the helmet and face mask from the intense heat of the fire. Race car drivers wear driving suits constructed of Nomex® and or other fire retardant materials, along with Nomex® gloves, long underwear, balaclavas, socks, and shoes to protect them in the event of a fire. The FIA and the SFI Foundation provide specifications for flame-resistant drivers clothing to be used in racing. The standards range from single layer suits that provide some protection against flash fires to much thicker multi layer SFI-15 suits required by the National Hot Rod Association that can protect a driver for up to 30 seconds against the intense heat generated by the nitromethane fuel they use. Military pilots and aircrew wear flight suits made of over 92 percent Nomex® to protect them from the possibility of cockpit fires and other mishaps. Recently, troops riding in ground vehicles have also begun wearing Nomex®. The remaining material is typically Kevlar thread used to hold the fabric together at the seams. In the U.S. space program, Nomex® has been used for the Thermal Micrometeoroid Garment on the Extravehicular Mobility Unit (in conjunction with Kevlar and Gore-Tex) and ACES pressure suit, both for fire and extreme environment (water immersion to near vacuum) protection, and as thermal blankets on the payload bay doors, fuselage, and upper wing surfaces of the Space Shuttle Orbiter. It has also been used for the airbags for the Mars Pathfinder and MER rovers, the Galileo atmospheric probe, the Cassini-Huygens Titan probe, and will be incorporated into the new Crew Exploration Vehicle that will replace the Shuttle after 2010. Nomex® has also been used for its unique acoustic qualities, the first time being used in Troy, NY at Rensselaer Polytechnic Institute's Experimental Media and Performing Arts Center EMPAC’s main concert hall. Nomex® reflects high-frequency sound, and increases mid- and low-level frequency sound. According to RPI President Shirley Ann Jackson, EMPAC is the first venue in the world to use Nomex for acoustic reasons. Honeycomb-structured Nomex® paper is also used as a spacer between layers of lead in the ATLAS Liquid Argon Calorimeter. The DuPont scientist responsible for discoveries leading to the creation of Nomex®, Dr. Wilfred Sweeny, earned a DuPont Lavoisier Medal partly for this work in 2002. The safer, more durable, more costly effective uniform fabric alternative. First: Do NOT use Chlorine Bleach. Second: Do NOT use Tallow Soap. USE Heavy Duty Detergent. Third: Do NOT use Fabric Softener. Fourth: Do NOT over dry. Use LOW heat. 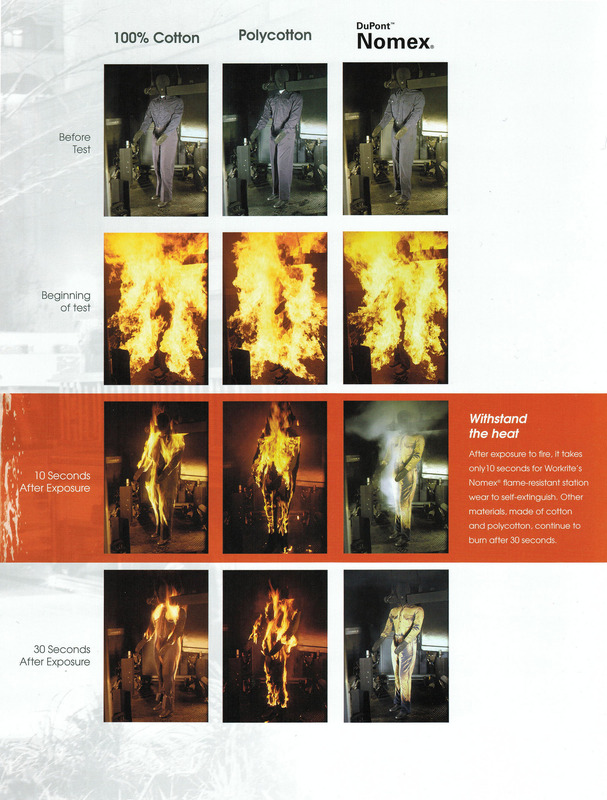 Nomex® dries very quickly. Fifth: Do NOT line-dry in sunlight. People working in any industry that has a hazard of clothing igniting should wear flame resistant clothing. The bottom line is that FR clothing saves lives! FR clothing is essentially worn as insurance. In the unlikely event of a flash fire, electric arc, metal splash or other catastrophe, FR work clothing reduces burn injury, provides escape time, and increases chances of survival. Even though a person caught in a flash fire or electric arc will likely have some injuries, FR clothing can dramatically reduce their severity. This can mean the difference between life and death. Survivors often consider burn injury treatment to be worse than the burn itself. Treatment and recovery is extremely painful and can take months if not years. Burn victims can be severely debilitated and permanently disabled. A survivor's quality of life is dramatically affected by the extent and severity of burn injury. FR clothing not only increases the chances of survival, but also significantly enhances the quality of life after the injury. FR CLOTHING CAN SAVE MONEY. Flame resistant clothing costs more to buy than everyday work clothing. But FR clothing can be a great investment that saves money in the long run. Some FR fabrics last considerably longer than standard work clothing, helping to offset a higher purchase price. Often, the cost of a single burn injury can exceed the cost of a complete FR clothing program. The cost of a serious burn injury can be staggering. Direct costs include medical (including expensive burn units), prolonged recovery and rehabilitation, disability, and job retraining. Indirect costs include workers compensation, lost work time, increased insurance premiums and potential liability. One electric utility company reports the total cost of a single burn injury before FR clothing at over $2 million, and after FR clothing at less than $50,000 for a comparable arc exposure. In the first incident before FR clothing, the employee never returned to work. In the second incident after FR clothing, the employee lost minimal work time. COMPLY WITH OSHA LAWS AND STANDARDS. FR clothing programs help protect employees from injury and death. FR clothing can protect the company as well. State and federal OSHA organizations require employers to protect employees from hazards in the workplace. OSHA has cited and fined numerous companies for not providing FR clothing under 1910.132 "Occupational Safety and Health Standards: Personal Protective Equipment". OSHA deals specifically with FR clothing in the 1910.269 "Maintenance Standard" for electric utilities. OSHA expects to add more stringent requirements for FR clothing in future OSHA regulations, including revisions of existing laws. In addition to laws, numerous voluntary consensus standards address the need for FR clothing in a variety of environments and industries. Standards are published by such well-respected organizations as American Society for Testing of Materials (ASTM) and National Fire Protection Associations (NFPA). While compliance is voluntary, OSHA considers a good-faith attempt to comply with standards as being evidence of an employer trying to protect its employees. Further, OSHA bases future laws in part on published standards, so what's voluntary today can become law tomorrow. Often, industry practice is the best guide for companies considering a FR clothing program. For many industries, FR clothing has become the norm, just like safety glasses and hard hats. A company can experience many benefits by following industry practice, including improved employee morale, protecting employees, reduced liability, complying with OSHA and standards, etc. · For maximum protection, FR garments should have a loose fit. · Layering FR garments significantly increases FR protection. · Wearing non-melting undergarments such as 100% cotton or wool can improve comfort and increase protection, provided that no portion of the non-FR garment is exposed. · The FR garment should be the outermost layer. Wearing flammable garments such as jackets or sweatshirts over your FR clothing can seriously add to burn injury. · Within each fabric type (for example, Nomex or UltraSoft), the heavier the fabric, the more protection the garment will provide. · Make sure your FR garment is appropriate for the potential hazard. While many FR fabrics/garments provide protection from several hazards, some hazards such as molten aluminum splash require special FR materials for maximum protection. Most flame resistant garments can be handled safely using common laundering and care procedures. However, a few precautions must be followed to ensure your FR garments maintain their maximum effectiveness. Remember. FR clothing is safety equipment that just might save your life. It is imperative to make sure your FR garments are properly cleaned and maintained. · Carefully follow the manufacturer's care label when laundering FR garments. Many FR fabrics require mild wash and dry conditions to maximize the life of the garment. · Wash new flame resistant garments prior to wearing. · Wash flame resistant garments separately from standard clothing. · Do not use chlorine bleach. · Make sure FR garments are clean and in proper repair before each wearing. · Remove oils and flammable contaminants from FR garments. Flammable contaminants can be a fuel source that adds to burn injury. · Repair garments using "like materials." Use FR fabric, thread and components. Return garments to the manufacturer for repair, or use an authorized FR repair facility. Home laundering instructions for Workrite's FR garments can be found on the label sewn inside each Workrite garment. Laundering instructions are specific to the type of fabric from which the garment is made. Manufacturers of flame-resistant fabrics provide detailed care instructions for both home and industrial laundering. For industrial laundering instructions or more detailed handling instructions, please call Workrite's customer service at 1-800-521-1888. Flammable contaminants will reduce the thermal protection of any flame-resistant garment. ● Wash your new garment before wearing and after each subsequent wearing to thoroughly remove potentially flammable contaminants. ● Wearing undergarments is recommended with all flame-resistant garments. Anti-static garments of Nomex® IIIA should be used in conjunction with proper grounding procedures for maximum protection against the threat of spark. Do not remove garments when in a hazardous environment. · For correct fit, try garment on before washing or wearing. · Wash new garments before wearing and after each wearing. · Wash garments of Nomex® IIIA separately from other garments. · Wash dark and light colored garments separately. · MACHINE WASH: Hot Water (Max 140°F/60°C), use Heavy Duty Detergent. · TUMBLE DRY: Low Heat (Max 160°F/71°C). NOMEX® fiber is heat resistant and permanently flame resistant. NOMEX IIIA® incorporates an anti-static fiber which reduces nuisance static. In static-sensitive environments, proper grounding procedures must be observed. Flame resistant garments should be removed immediately and replaced with clean FR apparel if they become fouled with flammable material. or chemicals that can overwhelm or mask the FR properties. accumulation of lint and minimize pilling. • Sort by shade to reduce staining or color transfer which may occur. flammable soils is more important than color retention. • Use a multiple add procedure (break and second suds) where soil level requires. bleach is acceptable where necessary. • Rinse well and sour properly. • As this fabric does not retain much moisture, short extraction at low levels should be sufficient. This should also reduce wrinkling. • Condition at 140°-160°F stack temperature so fabric temperature measured in the basket does not exceed 280°F. This fabric will dry rapidly. Do not over dry. Excessive heat will cause color loss. Cool down to 100°F or less and remove promptly from the dryer. • Shrinkage similar to 65/35 blends can be expected. The fabric will not stretch so allow for ease of motion in fitting wearers. • Tunnel finishing will improve fabric smoothness but may cause hanger impressions. If creases in pants are desired, pressing will be required. Do not exceed 280°F fabric temperature. • Wash and dry separately to prevent accumulation of lint. • Pre-treat greasy stains and do not overload the washer to help insure removal of soils. • Do not use chlorine bleach. Do not use starch. Do not use fabric softeners. • Do not over dry. procedures do not accomplish this, commercial laundering or dry cleaning is recommended. completely dried from the garment. information on care and cleaning.